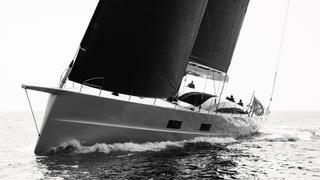 Paola’s husband, Salvatore, introduced her to sailing and they have owned more than a dozen boats, sailing the world. “Every stage of our lives has had a boat in it, and in recent years we started building our own,” says Paola. The Trifiròs began with a seven metre Calife Jouët and moved all the way up to the 50 metre Zefira before they decided to go smaller. “And slimmer and faster,” adds Paola. At this point Salvatore joins the conversation. The Trifiròs have since become fixtures on the regatta circuit, and if occasionally Salvatore isn’t first across the finish line, he’s always number one on the floor at the owners’ dinner-dance. While being competitive is important for Salvatore – the yacht won her class at the Maxi Yacht Rolex Cup in her first season – being generous is equally important to Paola. 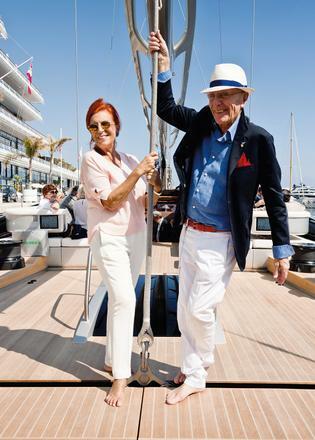 In Ribelle they have found the yacht that lets both of them shine. 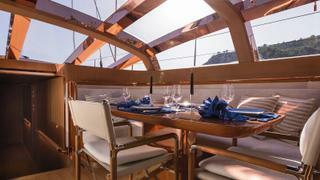 “For me, the privilege of being aboard Ribelle is the silence,” says Paola. 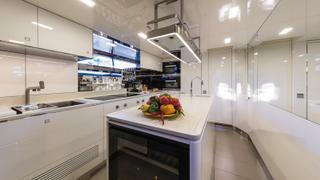 What Paola loves is cooking, so designing the galley was very important. “There are three sources of energy that drive a sailing boat,” she says. "One is the wind, another is the engine. The third is food. Even on our first boat, where we had one pot, one plate and one glass, I would always make a hot meal. I insisted on real tableware and real food because these are the things that give me satisfaction. When Paola proposed an island in the galley, even McKeon wasn’t sure it could be done. “I told him I knew what I was doing and I designed it. 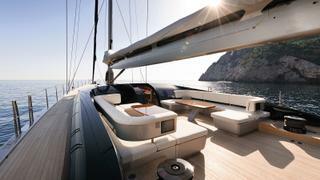 And I want to tell anyone who is building a custom yacht: don’t ask; know what you want and explain it. Express your will. In my case it was my galley, I knew what I wanted there. 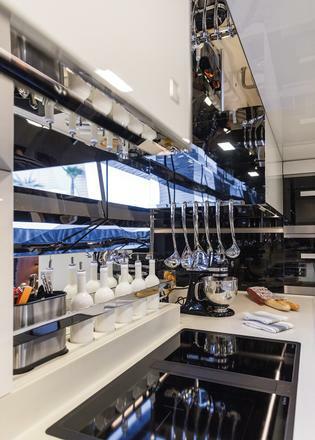 Ribelle is my style, my life and my special place for living well.” Of course, Ribelle’s Singaporean-born chef benefits from the insistence on a great galley as well.